Normally you can find Megan Daley ’11, G’16 engrossed in hydrology research in the College of Engineering and Computer Science, but this summer she is taking a break from streams and storms to take on an unexpected role writing for the Los Angeles Times. 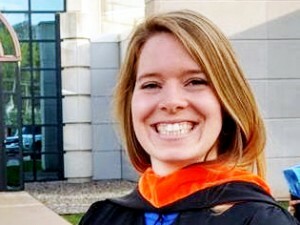 Daley, an environmental engineering Ph.D. student, earned the opportunity to try her hand at science journalism by being awarded an American Association for the Advancement of Science (AAAS) Mass Media Science and Engineering Fellowship—a competitive national award that places students in major media organizations such as National Public Radio (NPR), Slate and CNN. She discovered her passion for science communication while taking a class taught by Hillary Rosner, an environmental journalist who has written for major publications, including National Geographic, Wired and Scientific American. Daley’s class assignments put her in the role of learning about other people’s research and conveying it in an accessible and interesting way. The experience excited her and inspired a desire to delve deeper into writing. She approached Rosner for advice on finding ways to explore writing about scientific topics. Rosner suggested that she apply for the AAAS Fellowship, and the rest is history. With that sentiment as the basis for her endeavor, and the mentorship of some of the nation’s top science communicators at the LA Times, Daley has already seen her work published. Her articles include, “Lead exposure soared after kids in Flint started drinking tainted water, CDC says” and “Super-sticky saliva helps chameleons catch huge prey, scientists say,” with more to come throughout the summer. When she returns to Syracuse University this fall, Daley will continue research with Professor David Chandler studying how streams recede in the aftermath of storms in the Sleepers River Research Watershed in Vermont. She’s confident that her experience at the LA Times will help her convey the importance of her own research and open the door to further work in science communication.